A little while back La Casita Chilanga was the subject of a review by a fellow sandwich enthusiast, and I made a note to give the place a try myself. In order to keep the comparison strict I ordered the same thing, La Cubana. 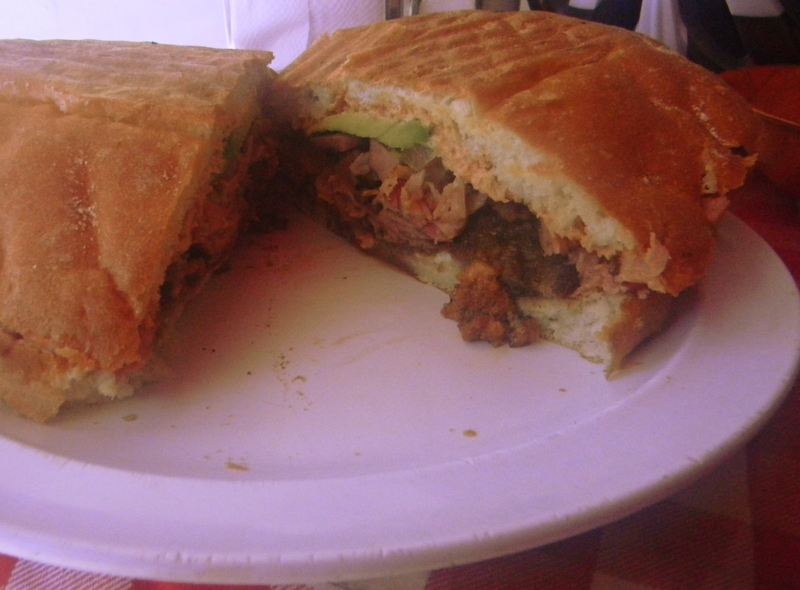 It’s a monster of a sandwich, as wide as the plate it comes on, stuffed with pork leg, ham, breaded beef steak, chorizo, and sausage, in addition to standard issue stuff like tomato, onion, avocado, and a chipotle mayo. From the linked review, I was expecting “an explosion of meat and crunchy grilled flat bread,” and so I was a bit surprised with what I got. Given such a physically wide palate, the Cubana is built not so much up as out. It isn’t a towering sandwich; there’s a lot going on but It handled well and was completely manageable. Altogether, the whole thing seems almost, well, restrained. This isn’t all upside, as a single portion of avocado was not nearly enough to cover the sandwich. That’s disappointing, but not entirely unexpected. In a sandwich this size, it’s difficult to get coverage the whole way across, and you often end up with ingredients pairing off rather than working all together. You get a bite of ham and steak here, a bit of chorizo and pork there. The ham had been crisped up via hot skillet or flat top, and that made all the difference in both flavor and texture. The sausage listed was, near as I could tell, the humble hot dog, but I note that as an item of interest rather than a fault. In fact, I found the ingredient combinations that presented themselves as I ate to be highly satisfactory, and overall would rate this a fine sandwich. This entry was posted in Sandwich Reviews and tagged Beef, Pork, Reviews by Pete, San Francisco, Sandwiches I Have Eaten, Sandwiches Made For Me, Torta by Pete. Bookmark the permalink. I for sure wanted more avocado. And tomatoes. But you’re right that the pairings were interesting and the sandwich solid. 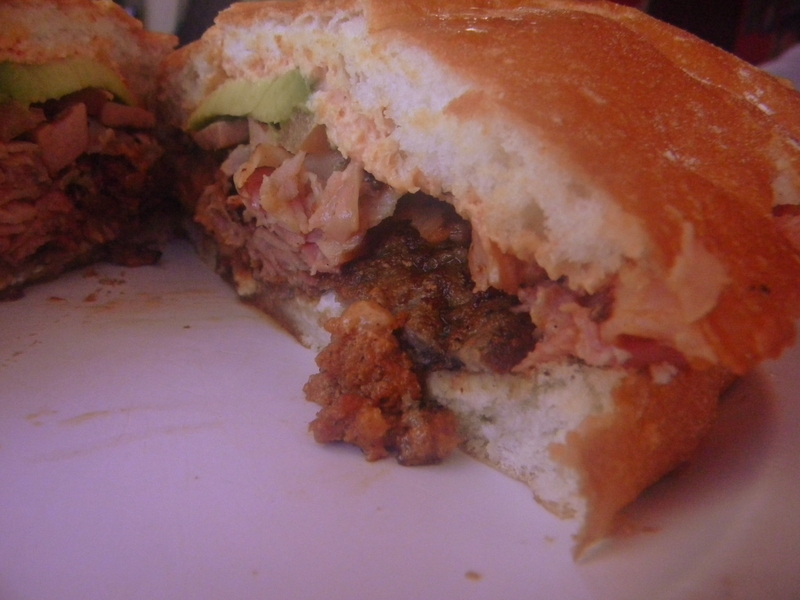 Supposedly the best Torta in my area of the peninsula — if I were to venture south to San Jose, where should I go? Mexico Bakery #2 is the best in San Jose. They have a location downtown and one on the eastside. The chorizo and milanesa are both choice. I’ve heard good things about Torteria Boos Voni in San Francisco, and I hope to cover them soon.